Festo, Grace, Zephaniah and William are our new Mission Partners through CMS. Through Festo’s personal family experience, God placed a burden on his heart for education. He believes that educating just one child in a family can help transform the whole family. A Tanzanian, he is head teacher at St John’s Seminary, which offers secondary education for young people aged 14–19. Grace is head teacher at St John’s nursery school (English medium). It aims to provide good education for the youngest of children, helping them to learn early on the English they will need later. As head teacher, Festo looks at the big picture of the school from nursery through to secondary and the Bible school. Together, we want to see an integrated and systematic education for students and to see the children from our village and surrounding area get the best education and opportunities they can. Grace also runs the volunteer scheme, setting up the placements before visitors come, conducting inductions and is responsible for all aspects of pastoral care. She organises teams that come out to work with us, teaches Bible knowledge at the secondary school, acts in an advisory capacity for other areas of the school and preaches and leads worship at the school and parish church. We were married in 2011 and started working together at St John’s Seminary in 2012. 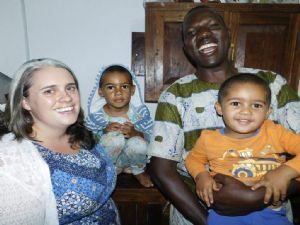 We continue to work there now as mission partners with our two boys, Zephaniah (aged four) and William (aged two). Festo has been working at St John’s Seminary since 2000. Grace grew up in Cornwall and since her mid teens has had a desire to serve God. She worked as a youth worker in the UK church for eight years before going out to Tanzania as a CMS short-termer in 2010. For us as we seek to draw ever closer to Jesus when there are many demands on our time and energy. For good relationships with staff at St John’s, that we would be able to pastor them in faith as well as lead them as educators. For our government in Tanzania, and for our president as he continues to try to bring an end to corruption in our nation. Please see the notice boards for the latest news about the family and their work.